Spray a casserole large enough to hold peppers upright with cooking spray. Place peppers in the casserole and sprinkle insides with a small pinch of salt. Pour about an ½ inch of water in the casserole. Add olive oil to skillet and sauté onions until soft, about 4 minutes. Add garlic and brown for 1 minute. Add ground beef and cook until browned breaking up with a spatula. Remove extra fat or liquid with a spoon. Add tomatoes, rice, salt and red pepper flakes, cook until everything is heated through. Remove from heat and stir in half of the cheese. 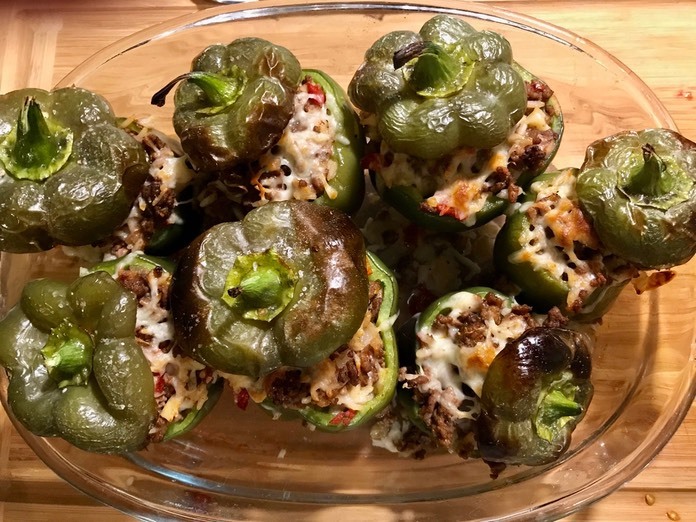 Stuff peppers with filling and top with remaining cheese. Bake in preheated oven for 20 to 25 minutes until tops begin to brown.